Let the experts help you file your bankruptcy. Perhaps you think you can use the internet as a resource in which to successfully find your financial freedom. In particular, My AZ Lawyers has helped clients in Mesa, Arizona with debt relief services. Specifically, you need not have questions, decipher the paperwork, worry about deadlines, handle worksheets and forms… the only resource you need is My AZ Lawyers. With payment options available, retaining the expert representation of My AZ Lawyers is cost-effective. Additionally, the firm recommends the one plan “File Now, Pay Later” to start your bankruptcy petition. My AZ Lawyers attorneys will spend time with you in order to help you understand what a bankruptcy can and should do for your particular financial situation. Also, you may discuss some of the aspects of bankruptcy that you are unfamiliar with or that need clarification. Bankruptcy is a specialized area of law. My AZ Lawyers has the attorneys who know this practice area and are familiar with the Mesa, Arizona bankruptcy court rules and customs. Filing for bankruptcy requires you to fill in over 50 pages of forms asking for detailed information about your current debts, assets, income, expenses, and intentions regarding any loans you may have that are secured by collateral (car loans). You must prove this information, then make a decision about what you intend on doing with secured debts (debts that are secured by property you own). Again, a good idea to have professional help when taking on this hurdle. In addition, bankruptcy rules can be unforgiving, and incomplete filings could easily happen without an attorney. To help you successfully complete the bankruptcy process — completing forms and getting legal advice, My AZ Lawyers is the firm to call: (480) 263-1699. 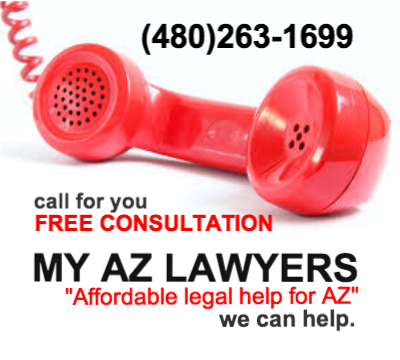 My AZ Lawyers will advise you on strategies which will maximize the benefit of your bankruptcy. Every client’s debt relief needs are different, so the attorneys will proceed with the best interests of every client in mind; they can interpret the law and know how it will apply to your particular situation. We can file bankruptcy with $0 money down. By all means, call for additional information. An attorney with My AZ Lawyers will prepare you for and accompany you to this meeting. At which time, the trustee can ask you questions about the information you put on your forms. Creditors do have the opportunity to attend this hearing and can ask questions and object to or challenge the exemptions you are claiming.